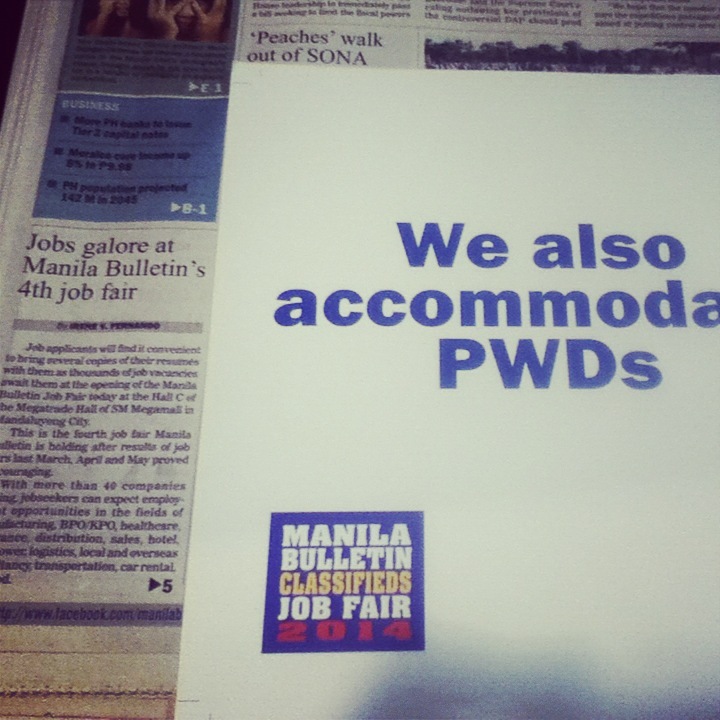 July 29, 2014, Megamall – First day of Manila Bulletin’s 4th job fair (or so I heard, not really sure *peace). And our company, as one of the exhibitor in the said job fair, sent me as one of the representatives (really?!) to represent our company. Of course, it is not really my first time to be part of a job fair, I already attended around 3 job fairs since I started working, but I still felt excited and at same time nervous about what would happen, how many applicants we will be having, or what time we will finish interviewing all applicants. When I said excited, I mean EXCITED, to the point that I don’t usually slept well the previous night before the job fair. Sounds like I’m a kid having her first outing? Yeah right. THAT is what I am always feeling (I can’t really do anything about it!). Anyway, the job fair officially opened at around 11:05 am., but before that, the organizers started it with the National Anthem (I saw some people not standing and playing around while the national anthem was playing *irritating! ), followed by an invocation, and lastly an opening remark (then ribbon cutting!). After that, there comes the flood of people, people who are hoping that they can find a job that day. And then my job there started, to interview applicants! In the job fair, there are all sorts of people, different educational backgrounds, coming from different provinces and cities, looking for different kind of jobs, having different religions, and having different views in life. But all in all, they are all the same in one aspect. They are looking for a job. Though personally, I would like to accommodate all types and kinds of applicants, but our company doesn’t ( it was crazy in my part), because you know, our company were only looking for those who are aiming for an agent post. I interviewed a total of 73 (very few) people, I think around 8 people passed, and 2 of them are already profiled to an account (just waiting for their PXT results, BGC, and JO)! Just like always, I enjoyed the job fair, and would like to be part of another in the future. And Manila Bulletin really made the job fair enjoyable (but I think I would have enjoyed it more if I was able to participate in their games but, of course I can’t and should not). so, we meet again Bohol. NIce to meet you Dumaguete!